Thin film electro-luminescent (TFEL) displays represent an interesting, if somewhat anachronistic display technology, now that we have high-contrast LCDs, plasma displays and of course OLEDs. The latter are actually closest to the principle of TFELs, and their primary optical advantage is identical: light-emitting pixels instead of backlighting, for maximum contrast. Where OLEDs use an organic polymer, which can be excited to emit visible light by applying an electric field, a TFEL does the same with an anorganic dielectric material like e.g., gallium arsenide (GaAs). The emitter pixels are sandwiched between two layers of transparent dielectric to insulate them from the transparent electrode grids on the front and back glass cover of the display panel. When a high-frequency current is applied, a current flows through the selected pixel and the emitter material lights up in a beautiful, saturated orange – in my opinion the most interesting aspect about this technology. 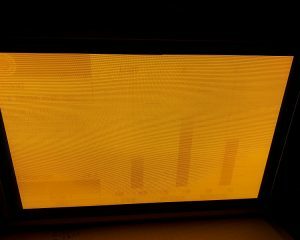 Remember the old terminals with the amber CRT screen? Close! In contrast to OLEDs, EL displays are also able to tolerate much harsher environmental and mechanical conditions, which makes them ideal for applications in heavy machinery – or living room gadgets, when they are retired. 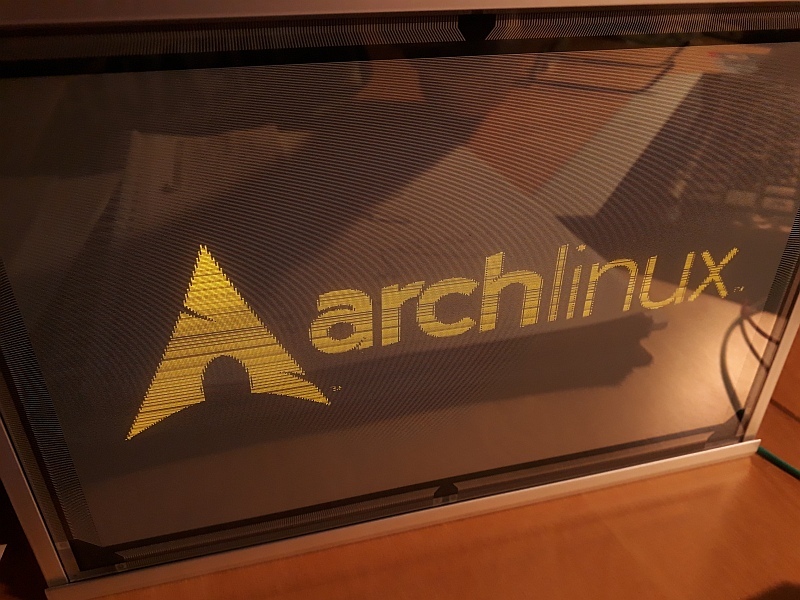 One flaw, which later also afflicted EL’s relatives plasma, VFD and OLED, is the infamous burn-in. 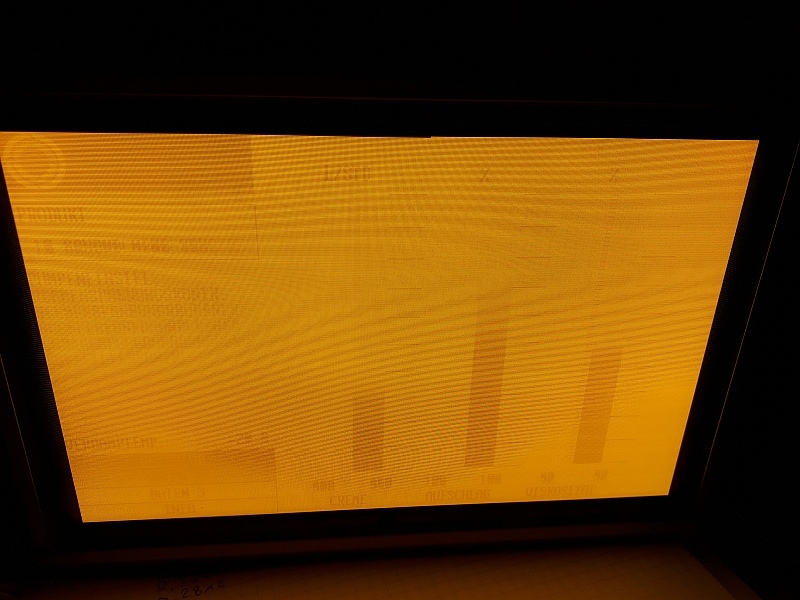 After long periods of displaying the same picture, the insulator and emitter can degrade, causing increased leakage current (pixels active when should be off) and brightness reduction (pixels dim when should be on). Both usually occur at the same time for worn pixels. Fig. 2a/b show how this looks. 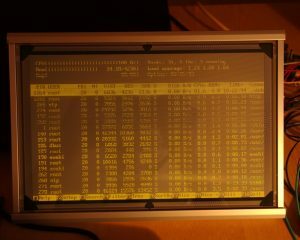 Off-screen ghosting strongly depends on the display drive and on the picture displayed. Both pictures were taken in test mode, which severely over-exaggerates the burn-in. In spite of all that, many such modules are available in good shape today. Although prices on ebay are sky-rocketing to say the least (500-1.200 EUR per piece! ), you can get lucky to find some original Finlux/Planar at low prices. I have managed to acquire two over the years, one being the EL640.400-CB1-FRA featured in this post. This one is my experimenting module since it already has some burn-in from excessive prior use. 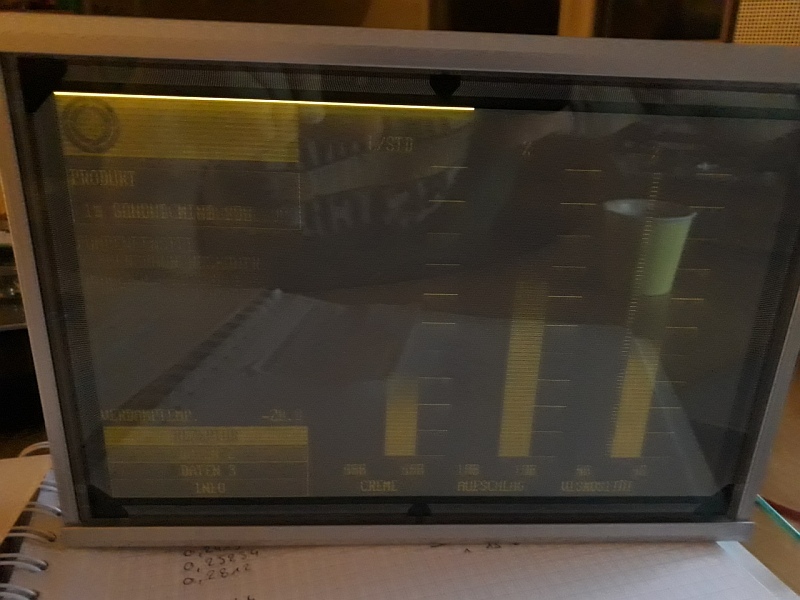 The other is brand new and will go into a retro-style terminal display, together with a Raspberry Pi as a networking backend and a motion detector to reduce power consumption. Unfortunately, controlling these displays can be quite a pain. At least, complete datasheets are available everywhere, so we don’t have to poke in the dark. The default source signal is VGA compatible, although it is not analog but digital. For each pixel, a single bit (on/off) is sent, along with the corresponding video clock, hsync and vsync. Unless the feeding device has a matching VGA feature port (more common when ISA VGA cards were still “hot”), fast I/O is required to get a stable image. Basically, the display with 640×400 pixels needs to be scanned once per frame, per second. For each line 640+4 video clocks are needed, including the horizontal sync. After the last line, a blank is sent before the vsync to terminate. This requires another whole line. In total, this amounts to e.g., 644*401*20 = 5.164.880, or 5.165 MHz pixel clock at 20 frames per second. So, all in all none of the easier tasks in comparison to a SPI/I2C display. Additionally, the display does not have a RAM which stores the received image for automatic refresh, but instead the video data is shown directly as a scanline. The perception of a static image comes from rapid scanning, as with CRT tubes. My first attempt at full-res VGA using an ATMega CPU does not bear inspection. Although I got an image, the signal was obviously much too slow. Much better results were obtained by porting the program to a TI ARM Cortex M3, which ran at 72 MHz and made a clean and stable checkerboard picture. It did not do much else, though. So for the next attempt, I am trying to get the signals from a spare Raspberry Pi gen. 1 GPIO port (Fig. 3a). Mind that this is all quick & dirty, purely for the sake of experimenting what can and what can’t be done, and learning more about the Pi GPIO. There are many more efficient methods. So, how do we generate the signals? 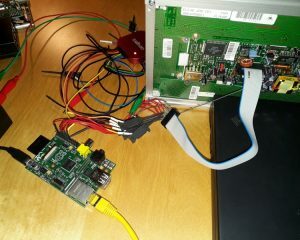 I am currently using a C++ library for fast GPIO access found on hertaville.com. 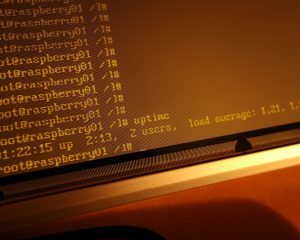 According to the author of the post, toggle rates up to 25 MHz should be possible on the Pi 1, although I doubt that the GPIO layout is really capable of such a speed without a suitable buffering circuit. If true, this should suffice for a 5 MHz clock. I can additionally lower the required clock frequency by sending two consecutive pixels in parallel as the display supports one additional data line. 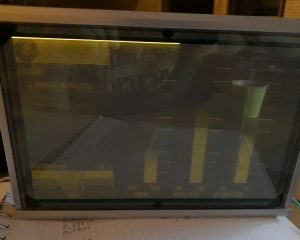 The connection to the display is set up as in Fig. 3, all remaining signals are left unconnected. Depending on the precise revision, an additional supply voltage is needed for the integrated DC-DC high voltage converter (e.g., 12V for the -CB1-FRA here). Finally, the display has to be configured for test-mode OFF, dual line data ON using the jumpers on the backside. Terminal layouts and function polarities differ between versions; for the -CB1 a single jumper in position 3 is required. Fig. 3: RPi GPIO pinout for connection of the TFEL signals. An additional 12V supply is required for VCC, but check your exact display revision datasheet as there are different voltage versions! 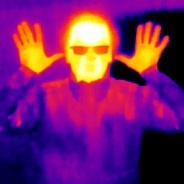 Init port and load 640 x 400 x 24bpp BMP file (or any other image source). Start writing first buffer line by applying pixel values to VID0/1 and sending clock. At half line, pull VSYNC high for the 8 VCLKs. Then release. When line finished, pull down HSYNC (is high on idle) and add 4 blank VCLKs. Then relase. The display will only show the last 640 pixels before a HSYNC is given, so the four blanks will not appear. Start next line in same shape, but without the VSYNC part. Repeat. At end of frame, send one additional line of 640 blank VCLKs plus 4 with HSYNC low. This will force the display to write the last line before skipping back. Fig. 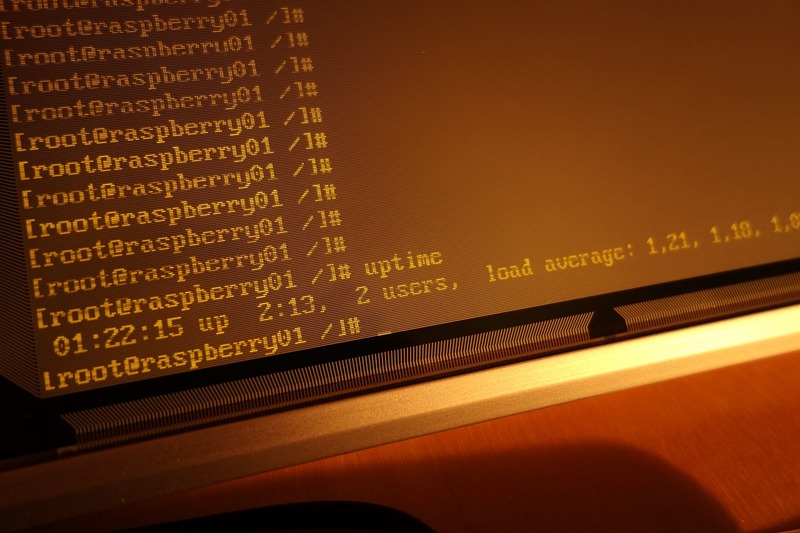 4a: Raspberry Pi gen. 1 hooked up to TFEL. Fig. 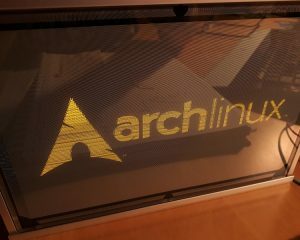 4b: Archlinux logo on screen. The image still looks ragged on the edges, which is at least partially a timing problem and can also be observed when displaying a grid or diagonal lines. I could nail down the timing issue to the line-writing function due to an image distortion appearing every 16-18 lines, relating to the number of writeLine() function calls. A parameter was originally passed to this function to indicate the current line to be written. A little piece of comfort, which seems to have created quite some compiled code. Instead, I now implemented a global pointer to the current pixel, which can be used by any function directly. Afterwards, the second issue was found easily: swapped data lines were causing the zig-zag edges. 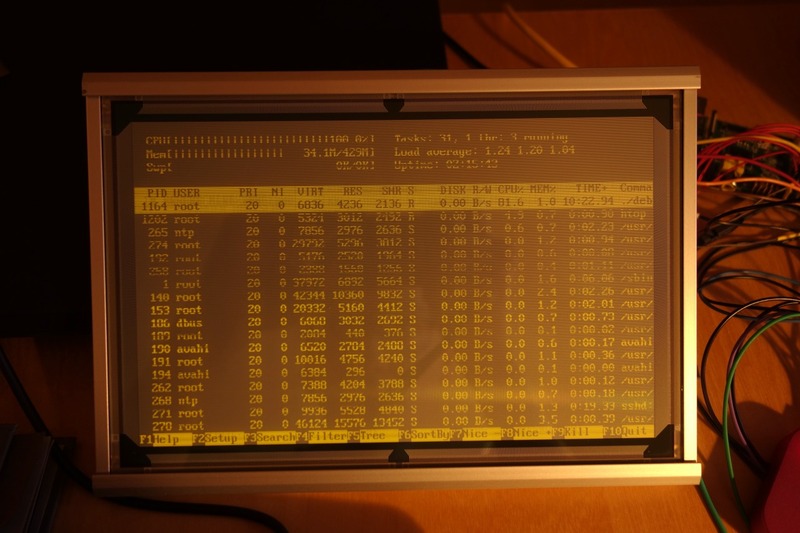 To top it off, I included a cyclic read of the /dev/fb0 framebuffer to mirror the active terminal on the EL display as seen in Fig. 5a/b. Aside from flickering and some residual distortions that are probably caused by the line levels and still need to be investigated, the output is pretty useable! Fig. 5a: /dev/fb0 output mapped to the TFEL driver. Fig. 5b: htop – missing lines are due to the cpu scheduler. Looking good! Let’s have a look at the actual timings being generated. Fig. 6: Logic analyzer snapshot of a single VGA frame sequence. Switching to pointers everywhere instead of the array addressing I use currently, allows for more efficient loops. Combining the write access commands for individual pins which could be switched at the same time, as the library currently only allows for single-bit access. Use a timed interrupt to get a stable framerate and release the CPU in breaks, to try and prevent interruption by the scheduler at unfortunate timings. Include a line buffer to normalize levels and lower source impedance for better signal edges. Move to a multicore Pi. 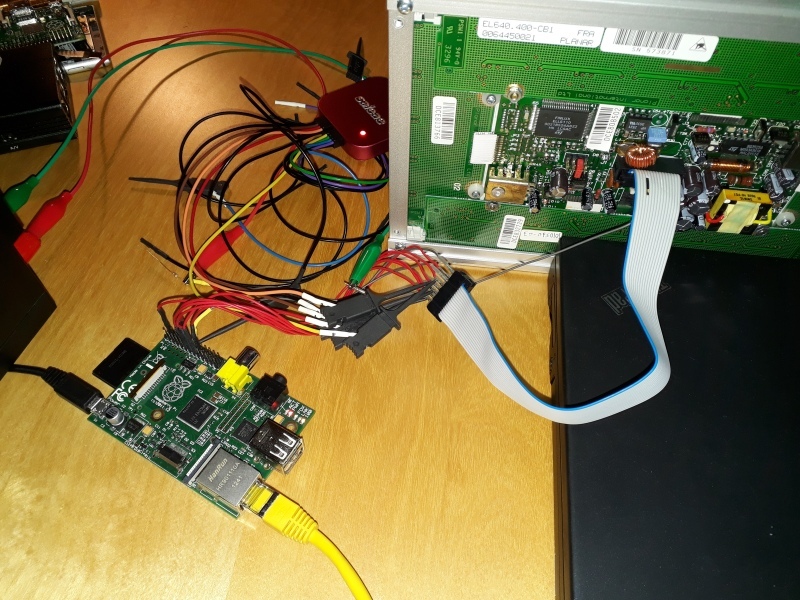 Ditch the whole concept and use the integrated DSI of the Pi for digital VGA. Or use some kind of external IC which can be fed through SPI…but it is nice to see how fast I/O manipulation can be on this cheap board. Before compiling, pull the mmapGpio-library from the link given above and copy the files mmapGpio.c and mmapGpio.h into the source directory. Then just run make. The pin mapping for the Pi can be changed in main.cpp. Very true, have been distracted by the job :-/ File is up now, have fun! It could use some more timing optimization though, I did not yet get around to that.